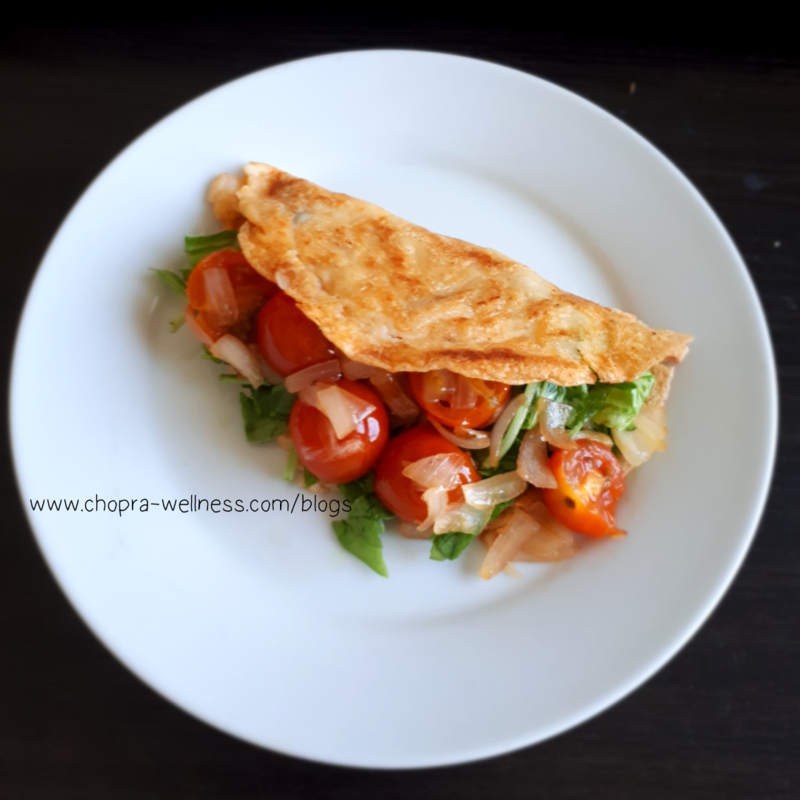 Breakfasts made easy with this simple vegan omelette recipe. This is a great option for your healthy breakfast. You can either prep it overnight, or over a Saturday, or even have it freshly cooked. It tastes awesome in all forms, trust me (I’ve tried it all). It is rich in protein, minerals and more. And whoever said, vegan or healthy doesn’t taste good, hasn’t tried this chopra-wellness yummilicious brekkie. It is yummm and would make you wanna have more. It is a simple recipe, which can be made by anyone. Yet again, it’s high fiber and low calorie AND absolutely delish! Perfect for fitness freaks and even those who’re wanting to lose those extra kilos/pounds. Place the mung beans in a bowl of water overnight. Next morning, grind them into a thick paste, add salt and chili powder. Bring a pan or tawa to a low flame, and sprinkle a bit of olive oil and add the mung paste to it. Make it disc-like shape. While the omelette cooks, take another pan to sautee the cherry tomatoes and onions together, until they are golden brown in colour. Once the mung omelette is cooked, see for brown thickness and colour. Place the mung omellete on to a plate once both sides are cooked. Add the raw baby spinach, then the cherry tomatoes and onions to it. If you prefer, add a little cashew sauce on top. Else, just have it like this. It is yumm nonetheless. Enjoy! It’s healthy and tasty. If you tried this recipe then let me in know in the comments how it was. And Hey! If you need to truly understand how and when can you add these recipes for your well-being… then hit me up! If you’re struggling to lose weight or those inches, I can help you. Check out my services too, to see the step by step process to help you reach your targets. And if you haven’t signed up for my weekly email, where I send awesome recipes, health tips and more… then SIGN UP NOW! 🙂 You’ll love it.